It's usually pretty obvious when your garage door springs are having trouble, from your door having problems opening to potentially refusing to move entirely, which is because they are integral to the system. If the opener is the brain that gets everything started, the springs are the muscles used to do the heavy lifting. They do this by storing energy in the form of tension that's able to lift up the door as needed, and it's why it won't be going anywhere if they're broken. There are two kinds of springs, torsion and extension, and they're different simply in how they create the energy they store. Torsion springs twist tightly to do this, while extension springs stretch out to. This variation causes extension springs to be the less liked version, as the constant pulling out of these springs to their limit makes them grow weaker much faster. They also tend to be dangerous thanks to snapping and ricocheting when they break. Attempting DIY with any parts of your garage door's system can be risky, but the springs in particular are far too dangerous to try to handle all on your own. They require thorough understanding and a careful hand of someone with experience, otherwise the spring may snap out of place and cause harm or may even bring the door crashing down. Allowing a professional to take care of it is the fastest and safest way to get your door working again. Our technicians can adjust your springs or get them replaced as needed before you know it! We're highly knowledgeable in both types and can take care of them easily. We'd be happy to take a look at all of your springs and see if any others need to be switched out while we're at it to ensure the longevity of the work! Call Garage Door Repair Denver today and get your door working like new again right away! Can I open a garage door with a broken spring? If your spring is broken, chances are your door will not be able to open. However, in some cases you may be able to pull the manual release cord to disengage the opener, which will allow you to open the door manually. However, it will be extremely heavy, so even if it can be opened, you should probably avoid doing this unless it's a major emergency and you have to get your car out. Be sure to get other people to help you if that's the case. Otherwise, give us a call and our technicians will replace the broken spring for you. How can I tell which type of garage door springs I have? It's quite simple to determine which type of these units you have. Torsion springs are larger and run along a shaft right above your garage door, parallel to the horizon. They wind or unwind as the door opens or closes, and therefore tend to make noise unless they're lubricated regularly. Extension springs are somewhat smaller and are situated on the sides of the door, parallel to the horizontal tracks (and not the horizon). They're always installed in pairs, and often attached to safety cables that anchor them if they break. My garage door spring tension is weak. What should I do? If the tension of your springs is weak, you may need to have it adjusted. It can be easy to tell whether or not you need to get this done, as the door won't be able to stay in place if you try to open it halfway. We don't recommend trying to do this yourself, as there's a major safety risk involved. 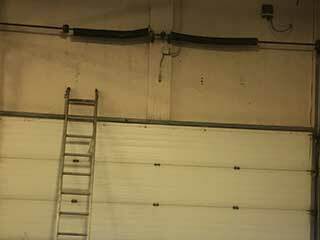 Lots of people get injured every year from tempering with garage door springs, so you'd be far safer leaving this type of work to someone like our technicians.